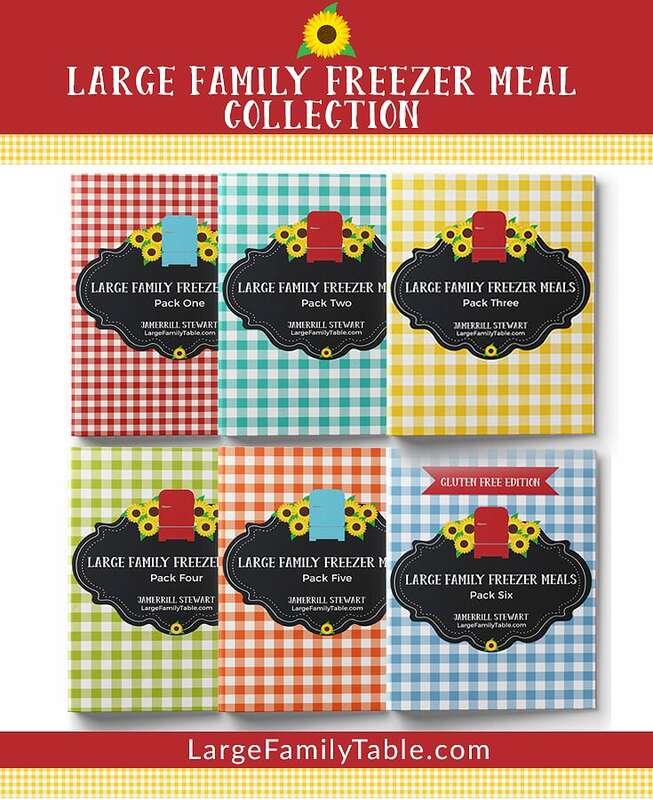 Of course, I love large family freezer cooking and getting a bunch of freezer meals in the freezer for the coming weeks and months! 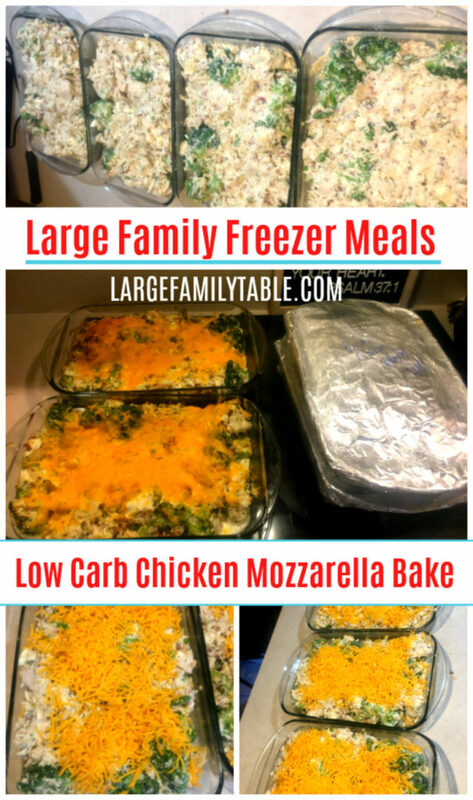 This low carb Chicken Mozzarella Bake is a spin-off of my Chicken, Broccoli, Rice Casseroleand checks a lot of boxes in the large family make ahead meals list! The version I’m sharing with you today is on the Trim Healthy Mama, Keto, and Low Carb side of life. 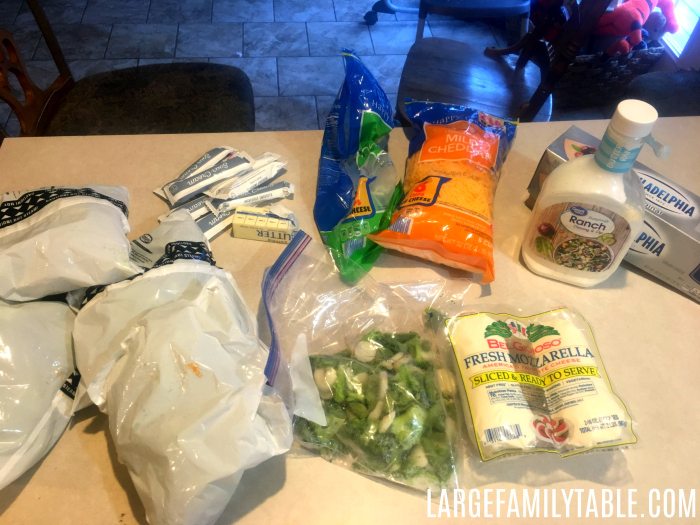 I had to get creative with some of the ingredients since I’m currently doing a large family pantry freezer challenge. You can see week one of my pantry/freezer challenge here. I whipped together these Low Carb Chicken Mozzeralla Bakes during week two. We are eating up and getting creative with odds and ends we have on hand. You’ll see I ran out of sour cream and improvised with ranch dressing. I still had several bags of frozen broccoli, but I also snuck in a small bag of other frozen veggies just to get those used up. 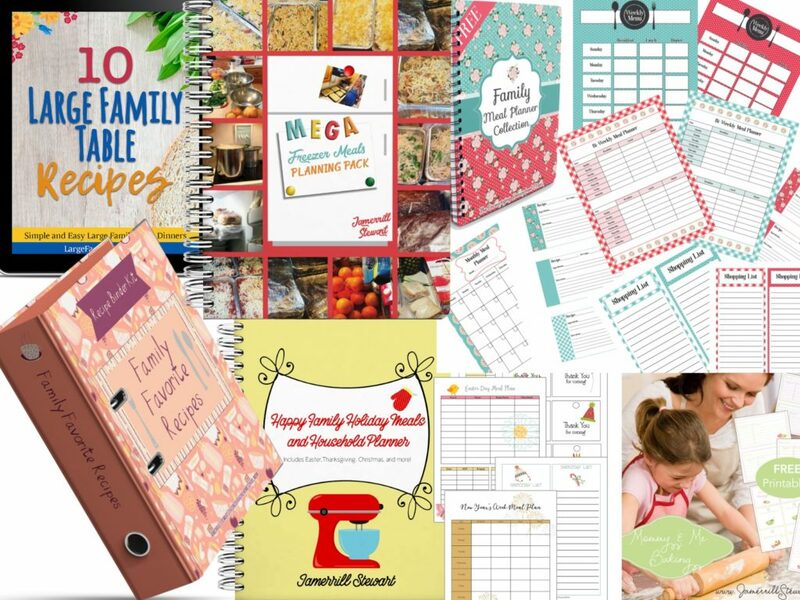 Total this large family make ahead meals recipe made four jam-packed 9×13 pans that my family loved! One pan was actually one meal since this is a filling protein packed dish. We had one for dinner the night I made it. The family had the next pan the following night (I was having one of my few and far between momma dedicated business work days). Then the last two pans I wrapped up and put in the freezer to be a low carb dinner on a busy night in the coming months. I cooked the total of 15 lbs of chicken in my 14 qt Go Wise Electric Pressure Cooker and my 8 qt Instant Pot. I mixed all the ingredients using my massive (and favorite) 3o qt metal mixing bowl. This giant bowl really helps me in cooking my bulk large family meals! 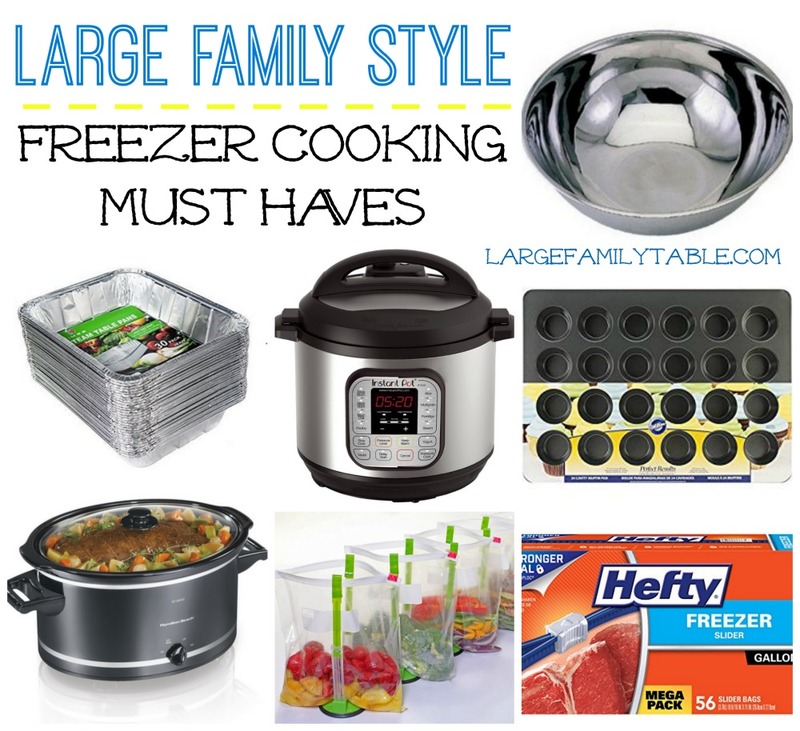 You can see my favorite large family cooking tools here! Enjoy this hearty protein-packed low carb Chicken Mozzarella bake as a family favorite dish! 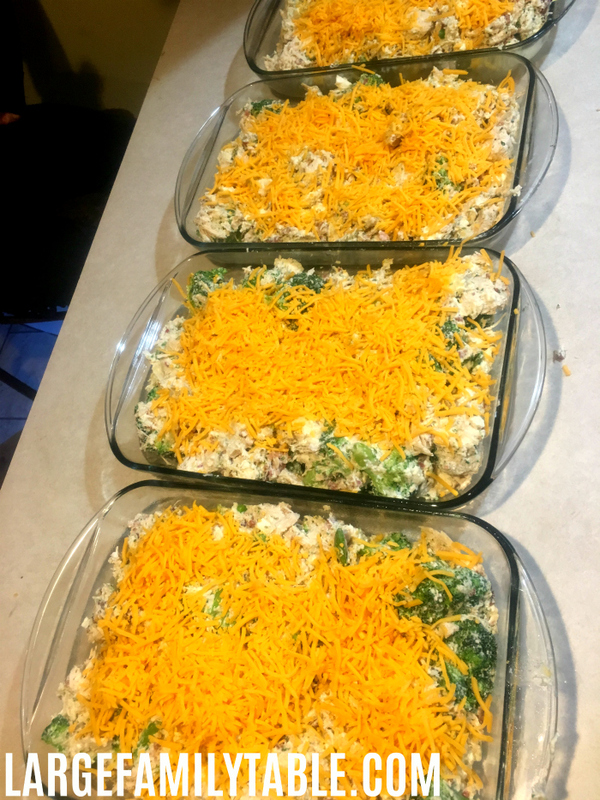 Make ahead four 9×13 casserole pans to have this healthy meal in your freezer for busy nights when you still want to not eat heavy carbs. Mix all of the above ingredients together in a large mixing bowl. Divide amongst four 9×13 baking pans. Top each pan with 2 cups of shredded cheese. Bake immediately at 375 degrees for 25-30 minutes or until hot or bubbly. Serve with salad or fresh veggies. For bulk freezer meals option wrap remaining pans in two layers of foil and two layers of plastic wrap (label/date your meals!). Place in freezer for 3 months. When you’d like to use one of your freezer meals place in the refrigerator the night before. Remove foil and plastic wrap. Bake in a preheated oven at 375 degrees for 45 minutes or until hot or bubbly. Oven/cooking times may vary based on the beginning temperature of your meal. Always bake your meals to an internal temperature of at least 165 degrees. 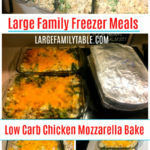 🍗 LARGE FAMILY Make Ahead Meals | Cook ONCE Eat FOUR Times!!! Click here to watch this large family recipe in action in today’s new large family make ahead meals video! Also, if you haven’t gotten your FREE Large Family Food Collection go ahead and grab that here! 😇👍💖 God Bless You for sharing your compassion for creative culinary Nutritional meals. This might be a dumb question, but for the remaining pans you want to freeze….do you bake them at all or just freeze them as soon as they are assembled? I guess the chicken is already cooked…it;s really about warming them up and getting the cheese all melty?